A complete shake-up in the way cattle are exhibited has paid off for the Cornish Holstein Club. Nick Warren (centre) and Wendy Symons who took the championship and David Higman of Mole Valley. Faced with dwindling exhibitor entries to its annual evening show, the club decided to host an ‘on-farm challenge’ event instead which has seen a promising response from members and significant rise in entries on its launch at the end of October this year. In a bid to take away the hassles previously associated with the show and attract more entries, the on-farm challenge see’s exhibitors enter as they would have previously but rather travel to a show to exhibit their animals for judging, this is done at their own farm. Classes were offered as they would have been at the event, although animals were to be shown un-haltered and without any topline clips, on a hard-standing area of the farm. 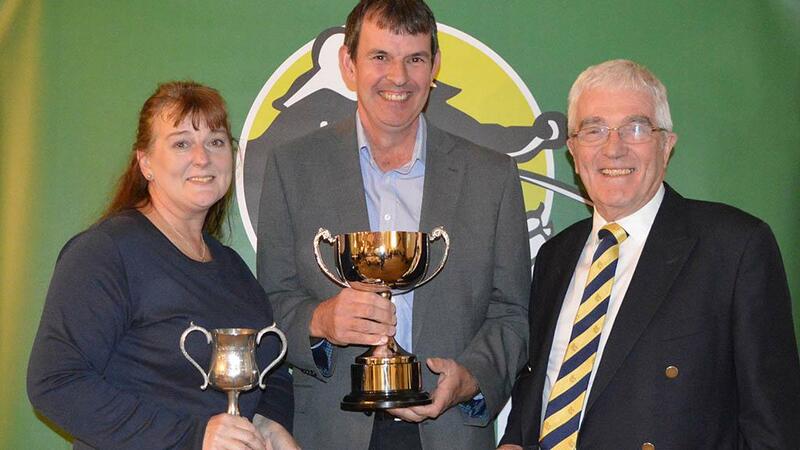 The judge and stewards travel from farm to farm by appointment over a week-long period for judging, with all visits filmed and photographed for display at the following awards evening at which all of the results were presented. The club had 102 entries from 23 exhibitors forward for the on-farm event this year, compared to three for the annual autumn show at its lowest point. Cari Thomas club secretary was involved in organising the event along with club chairwoman Dawn Coryn and Holstein UK classifier Lynden Bustard. Miss Thomas says: “We wanted to hold an event which was inclusive and would attract more of our members and felt making the concept of showing more accessible would be appealing to a wider audience within the club”. “Showing cows does not appeal to the majority of our members as many are unable to commit to an event like the evening show because of things like time and labour constraints. “Many of our regular exhibitors are also under TB restriction and meant the evening show had seen limited entries recently. The new format has given those who do not usually show their cattle an opportunity to exhibit their stock without the challenges. “The concept has been in the pipeline for more than a year so members were aware of the change and everyone we have spoken to since it went ahead have said how much they enjoyed it and got out of it.